On March 25, Robert Williams of Metal-Rules.com conducted an interview with bassist/vocalist Schmier of German thrash metal veterans DESTRUCTION in Austin, Texas. You can now watch the chat below. DESTRUCTION's 30th-anniversary album, "Spiritual Genocide", was released on November 23, 2012 via Nuclear Blast Records. The follow-up to 2011's "Day Of Reckoning" was recorded at Gernhart Studios in Troisdorf, Germany with engineer Martin Buchwalter and was mixed by Andy Classen. The album features guest appearances by Thomas "Angelripper" Such (SODOM), Andreas "Gerre" Geremia (TANKARD) and Ol Drake (EVILE). In addition, the "Mad Butcher"/"Release From Agony" lineup of DESTRUCTION — featuring guitarist Harry Wilkens and drummer Oliver Kaiser — reunited for one song. 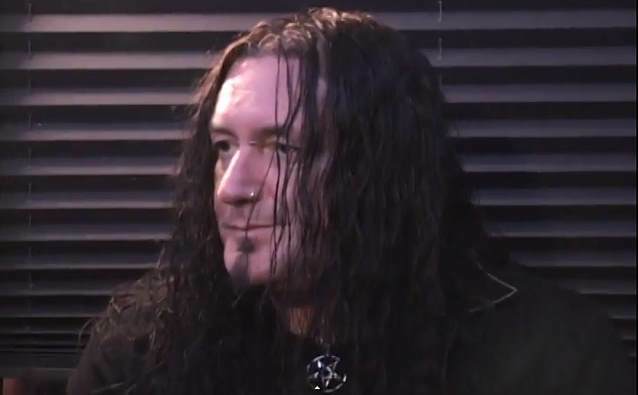 Asked how DESTRUCTION's sound has evolved over the years, Schmier told Metal Assault, "We were 17-18 years old when we started, and we were young and wild. We didn't play that well at the time. Of course now, we have the experience of 30 years and our playing skills are totally different, so we cannot really compare, but I still compare the style of music and it's still thrash metal. We still do it with a lot of emotion and a lot of aggression, and those things will never change. I think we even came more brutal and more aggressive with this new album as compared to the old ones, actually. DESTRUCTION [in 2014] doesn't sound like an old band."